What Do Customer Satisfaction Metrics Really Measure? Customer satisfaction metrics can help you analyze your current customer experience and find room to improve satisfaction and churn rates. Measuring customer satisfaction isn’t a new concept. Doing so is one of the best ways to deliver a positive customer experience and to dig deeper into understanding what your customers want and need. A 2016 study by Spigit found that 75% of companies wanted to improve their customer satisfaction and overall experience, and that number has only increased in the following years. Seeing as measuring customer satisfaction is generally a low-cost strategy that helps decrease churn, boost customer loyalty and keep customers happy. It’s really a no brainer that business owners are paying more attention to these metrics. Used extensively by customer support teams (and occasionally marketing and product management teams), there are three big players when it comes to measuring customer experience: Customer Satisfaction, Net Promoter Score and Customer Effort Score. All three involve extracting customer opinions from carefully designed surveys and aim to measure the customer experience, problem resolution and the support process. Putting in place a process that analyzes Customer Satisfaction, Net Promoter Score and Customer Effort Score or a combination, will lead you out of the dark and shed light on how you can improve your overall customer experience. Below is an overview of these important Customer Satisfaction metrics and the role they play in your company’s success. Customer Satisfaction Score (CSAT) is widely known as the original metric for measuring customer satisfaction. Heavily used by customer support teams it’s simple to use, yields quick results and doesn’t take much training for teams to understand its purpose. CSAT can be used in multiple ways. It can be used as a tool to gain feedback on every interaction and rate individual agents, giving your team the chance to intervene with dissatisfied customers immediately. Or it can be sent out as a survey once a support conversation is completed. 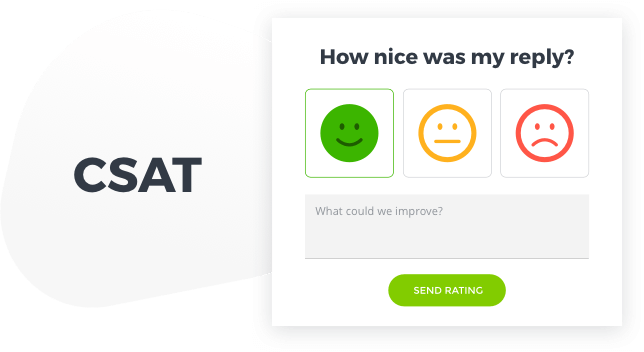 For example, Nicereply asks, “How nice was my reply?” after each response to gauge satisfaction during email conversations. The questions asked can be tweaked as necessary – for more examples check out this post. That being said, CSAT gives insight into how your support team is handling things and allows for instant action. But it doesn’t do much in terms of predicting long-term results like customer loyalty. This is due to the fact that it doesn’t address the large pool of customers who aren’t interacting with your business on a regular basis. Which is where the Net Promoter Score (NPS) comes in handy. Where CSAT gives voice to active customers or those who have had a particularly good or bad experience, NPS focuses on the long-term happiness of your customers. Where CSAT asks how satisfied your customers are, NPS asks how loyal they are. Which is a very important question considering loyal customers are worth up to 10 times their initial purchase. 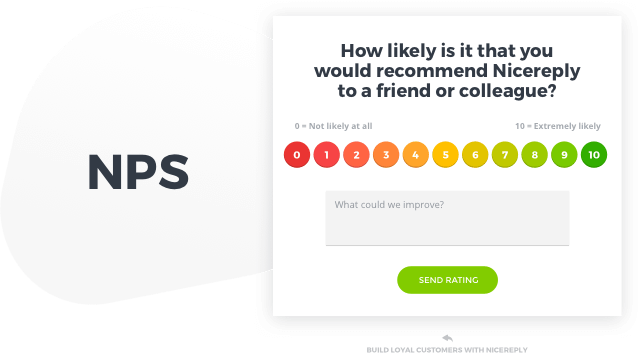 The Net Promoter Score is specifically centered around the question, “What is the likelihood that you would recommend [ company name] to a friend?” Customers can then respond on a scale from 1 (very unlikely) to 10 (very likely). Those responses separate customers into three categories: promoters (score 9-10), passives (score 7-8) and detractors (score 0-6). The total NPS which ranges from -100 (very bad) to +100 (very good) is calculated by subtracting the average percentage of promoters from the average percentage of detractors. Overall, detractors tend to use support resources and often result in poor reviews and churn. But promoters are the ones who boost profits as long-term customers and are more likely to refer your company. Measuring customer satisfaction is generally a low-cost strategy that helps decrease churn, boost customer loyalty and keep customers happy. 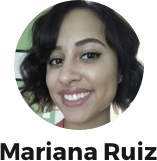 NPS is not only of value to customer support teams but product managers and marketers alike. As a company wide metric, it has the ability to measure customer experience across multiple channels and touchpoints. Since NPS focuses on the long-term many companies send surveys out over time (ie: quarterly) and to a random selection of customers vs. recent interactions in order to get a true look at customer experience. You might’ve already guessed, but the goal here is to turn detractors into happy, loyal promoters. It’s no secret that customers are more likely to share negative experiences than positives ones. So monitoring customers who fall in the detractor category and assisting them as needed will help boost an NPS score. To do this, pay attention to the explanations customers give you for their ratings. Using this qualitative data will help your team figure out the reasons behind a detractors negative experience and how you can help them. It can also serve as a boost of confidence by letting you know exactly why people love your brand. Although NPS and CSAT are different in their approach, they still compliment each other very well. Combined they piece together how to improve both the short and long term happiness of your customer experience. To be brutally honest, 96% of customers who go through high-effort experiences with a brand won’t be coming back for more. Which is why it’s crucial to hear from customers when they’re frustrated and not let them suffer in silence. Created in 2010, the Customer Effort Score is fairly new to the scene but is becoming increasingly more popular. Ever been burned by a company’s support team? Long wait times, vague answers, and way too much back and forth. That’s exactly what the Customer Effort Score (CES) aims to eliminate. More complex than NPS and CSAT, CES is a long-term metric that’s great at predicting future customer behavior. In fact, a study by the Harvard Business Review revealed that the Customer Effort Score had stronger predictive power when it came to customer loyalty than CSAT and NPS. Again, these metrics are usually more revealing when used together. For example, support teams that boast a high CSAT scores will find CES most useful because it can show them new ways to improve. And high NPS score tend to correlate with strong CES scores. These customer satisfactions metrics aren’t a one and done situation. The data gathered from any of these surveys is only valuable if you use it to take action towards improving. Even, and especially, if a bit of truth you don’t like surfaces. For the best results, don’t rely on a single metric to tell you everything. Instead combine these customer satisfaction measurements in a way that’s best for your company needs. Using a tool like Nicereply can help your team to manage all of your customer service metrics. Our team can even help you find the metrics that best suit your business. The post What Do Customer Satisfaction Metrics Really Measure? appeared first on Customer Happiness Blog.